Pastry for 1000? No Problem. I spent last weekend at the Pebble Beach Food and Wine Event. It is a three day eating and drinking extravaganza. I made desserts for two events — a Friday lunch called The Romance of Italy and a walk around tasting on Sunday. For the Italian themed lunch I joined forces with several talented chefs. At events where different chefs prepare each course the overall meal can often be disjointed and the food doesn’t flow from course to course. This was not one of those times; all the food went together really well. Everyone was very happy when they left. While I got my fair share of Jonathan’s juicy steak standing in the kitchen, I wish I had been sitting down for all the courses. The Grand Tasting consisted of food and wine stations serving more than a 1000 guests. There were about 15 chefs and at least twice as many wineries represented. Bill Corbett from Absinthe and I were the only pastry chefs. For a pastry chef, tasting events are pretty much the same. When it starts people see I am serving dessert and most say “I’ll be back, I need savory first.” But there are quite a few who dive right in regardless of the fact they just arrived. Not surprisingly I am partial to these people, and offer them seconds. As the event progressed and the wine and savory offerings settled into people’s stomachs, the line in front of my pastry station got longer and longer. Nothing like Brownie Brown Sugar parfait after a couple glasses of wine. 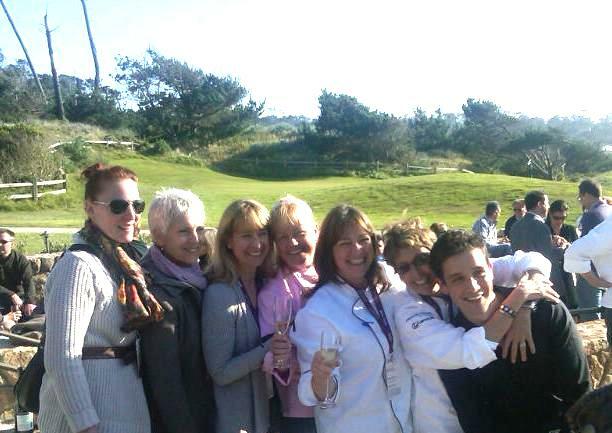 About 100 chefs participate in the Pebble Beach event. We take part because it’s important to keep the restaurants we work for in the public eye. In my case, I also wanted to showcase my new book, The Fearless Baker. Visiting with other chefs is an added benefit. There aren’t many places where you can hang out with fellow pastry chefs Mindy Segal, Claudia Fleming, Sherry Yard, Gale Gand, Hedy Goldsmith and Yigit Pura, compare war stories and have a lot of laughs with a view of the Pacific Ocean. That sounds like a phenomenal menu! Congratulations on the new book! I was sad that I missed you. I was at the tasting tent on Saturday. I did get to meet Sherry yard who is just adorable and so friendly. Congrats on the book! Hi, Irvin. Apologies about the late reply — and thank you very much for the well wishes on the Fearless Baker! Truly appreciate it.